This entry was posted in Uncategorized by Picture Stockton Team. Bookmark the permalink. Thank you Gentlemen for the reference and two wonderful films of which I was unaware. I am a Nortonian vintage 1928 and therefore proud Teessider. I left Norton and Stockton for a new job in Leeds and was unaware of these two celebrations. When I left Stockton was still producing shipping and I won’t ever forget the sound of the riveters making landing craft etc. I get a lot of pleasure from Pictures Stockton in keeping up with the latest happenings. Thanks again. 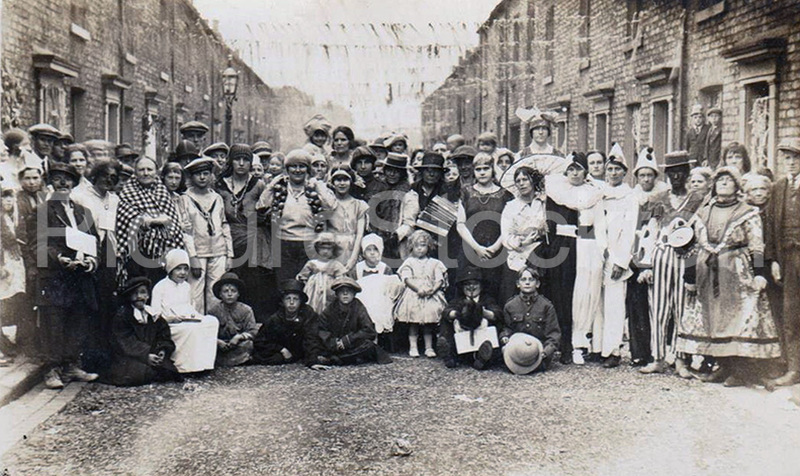 This street party was held to celebrate the Centenary of the Stockton and Darlington Railway. 100 years later the local Railways Heritage Group, will oversee the collaborative efforts of a small number of organisations currently working together towards publicly celebrating the 200 years – 2025 bi-centenary for the Darlington to Stockton railway line, and,the first ever Stockton based rail travel booking office. Trish Pemberton, chairperson of the Friends of the Stockton and Darlington Railway, recently said: “The Friends have been working to raise the profile of the railway for many years, and to save its important heritage.“ The 2015 Anniversary scheme is being led by a partnership which includes Darlington Council, Durham County Council, Stockton Council, Historic England, Friends of Stockton and Darlington Railway, Network Rail, Northern Rail. The 27th September 1825, was a memorable day in the history of railways, for on that day a steam train made its first journey on the Stockton and Darlington Railway. To commemorate this historical event, special celebrations were held in Darlington and Stockton during the first week in July 1925. This 1925 Centenary Event included a procession of locomotives and rolling stock, which was to travel over the old railway line and the spectators took advantage of the beautiful weather to make a picnic of the event, it is estimated that a quarter of a million people lined the edge of the railway between Darlington and Stockton. Between the villages of Dinsdale and Urlay Nook, grandstands had been erected for the accommodation of the visiting Royal party and distinguished visitors, there was great eagerness to see the Duke and Duchess of York, who were paying a special visit to inaugurate the Centenary Celebrations. A burst of cheering greeted the appearance of a full sized model of the famous “North Star engine” built in 1837 by Robert Stephenson & Co. A burst of laughter and cheering greeted the next exhibit, which turned out to be No. 7133, a shunting engine built by the Great Eastern Railway in 1897. Finally, the “Flying Scotsman” came into sight – a train used on the East Coast Route to Scotland. The last exhibit in this wonderful railway pageant was, perhaps, the most eagerly awaited by the spectators. It was “Locomotion No. 1” the original engine that drew the first train over the Stockton and Darlington Railway line. Locomotion carried many passengers including the directors of the LNER line, who were travelling in the only remaining original Locomotion coach still in existence, the directors were attired in the same style of dresses as was worn by the original passengers a century ago. The men wore frock-coats and tall beaver hats, and had side whiskers and wigs. The ladies wore sun-bonnets, and skirts with flounces and ribbons. The bandsmen struck up “Auld Lang Syne.” As the strains of the famous old tune rang out, the Duke and Duchess and the other guests rose to their feet until the veteran engine departed. After the procession had passed, Viscount Grey presented the Duke of York with a silver replica of “Locomotion No. 1” and tender, and the Duchess (nee Elizabeth Bowes Lyon – later The Queen Mother) with a silver replica of the historical Stockton and Darlington passenger carriage. The Mayor, in proposing the health of the Royal visitors, said:- “You meet us in celebrating the enterprise of a past age and in celebrating the achievements of George Stephenson and others who were responsible for the first public railway using steam locomotion. Bob Wilson. There is a film of the 1925 celebrations on the British Film Institute site (BFI) made by Debenhams of York, as far as I know not associated with the shop of the same name, it is a very interesting piece of social history. There is footage of the Duke and Duchess of York as well as shots of the locomotive parade and the unveiling of the plaque on the Stockton ticket office and film of Stockton High Street and a tableaux presentation. Also on the same site is a film of the Queen and Duke of Edinburgh’s visit to Stockton in 1956, it includes many shots of school children attending the celebrations, take a look you may feature in it. I can confirm it is Metcalfe Street / Bolsover Road. My dad has this same photo. Correct! The hundredth anniversary of the opening of the Stockton/Darlington railway. Thought that was September 1825, could the date be wrong?